DIABETES SUPPORT GROUP: Learn more about Type 2 diabetes from 1:30-3 p.m. at the Milwaukie Center, 5440 S.E. Kellogg Creek Drive. Also April 15. NATIONAL WALKING DAY: Join the Rose City Roamers for a free, one-hour walk at 9:30 at the Pioneer Community Center; registration opens at 9 a.m. Participants must be 21 and over to participate. For details, call 503-657-8287 or stop by the Pioneer Center. MINDFULNESS MEDITATION: This workshop, open to all, is from 6-7:30 p.m. Wednesdays, through April 3, at the Milwaukie Center, 5440 S.E. Kellogg Creek Drive. To register, call the Milwaukie Center at 503-794-8092 or go online to ncprd.com. BLOOD DRIVE: Co-hosted by the Red Cross and Rotary Club, stop by anytime from 1:30-7 p.m. at the Museum of the Oregon Territory 211 Tumwater Drive, Oregon City. WALDORF OPEN HOUSE: Visit classes at the Portland Waldorf School from 9-10:30 a.m. at the school, 2300 S.E. Harrison St., Milwaukie. The tour will be followed by a Q&A session with the school chair. Call 503-654-2200 for details. OREGON HUMANITIES CONVERSATION PROJECT: Today's topic is "Bias and Kids: How do our prejudices affect our children?" The event takes place from 4-5:30 p.m. at the Oregon City Library. FAMILY STORYTIME: This activity is for children ages 2 to 5 and their families. It takes place at 11 a.m. at the Oak Lodge Library. Also April 12, 19 and 26. SENIOR EXCURSION: Hike to Champoeg Park with the Gladstone Senior Center. The bus leaves at 9 a.m. and returns at 2 p.m.; fare is $7. Call 503-655-7701 for more info. FIRST FRIDAY FILM: See "Helvetica" at 6:30 p.m. at the End of the Oregon Trail Interpretive Center, 1726 Washington St., Oregon City. SATURDAY STORYTIME: The Gladstone Library's newest storytime for all ages takes place at 9:30 a.m. Saturdays. SATURDAY STORYTIME: Ages 2 and up are invited to this event at 11 a.m. at the Oak Lodge Library, 16201 S.E. McLoughlin Blvd., Oak Grove. Also April 13, 20 and 27. TITLE IX TALK: Jackie Sandmeyer, founder of TIX Education Specialists, will speak on "Title IX - Bridging Compliance and Best Practices" at 9:30 a.m. at Oswego Heritage House, 398 10th St., Lake Oswego. AAUW Lake Oswego invites everyone to this free, no-tickets-needed event. OC ENHANCEMENT DAY: Celebrate Earth Day and Arbor Day from 9 a.m.-noon. Gather at 8:30 a.m. at the End of the Oregon Trail Interpretive Center, 1726 Washington St., Oregon City. The focus will be on beautification and planting trees, shrubs and flowers. For details, call the parks department at 503-496-1201. LEGOS: Build with other LEGO fans from 1:30-3 p.m. at the Oak Lodge Library. CHILDREN OF PALESTINE: Rev. Diane Dulin will lead a discussion about the justice issues facing Palestinian children from 5-7 p.m. at the Clackamas United Church of Christ, 15303 S.E. Webster Road, Milwaukie. FOOD FOR FINES: From April 7-13 all libraries in Clackamas County will offer $1 off fines per nonperishable food item donated; no expired items and no ramen. The offer applies to overdue fines only. REVAMPING BOOK CLUB: All are invited to participate in the revamping of the book club that meets at the Pioneer Adult Community Center. The meeting takes place at 10 a.m. at the center, 615 Fifth St., Oregon City. Call 503-657-8287 for more info. BRAIN GAMES AND TRIVIA: This class will exercise your mental muscle. It takes place from 10:30-11:45 a.m. at the Milwaukie Center. There is a $1 drop-in fee. Also April 22. BABY SIGN LANGUAGE: Learn sign language to improve communication between you and your child at 11 a.m. at the Oak Lodge Library, 16201 S.E. McLoughlin blvd., Oak Grove. No registration required. Also April 22. OPEN HOUSE: A open house about code updates to the Beavercreek Concept Plan takes place 7 p.m. at Oregon City High School, 19761 S. Beavercreek Road. More information at orcity.org/community/beavercreek-road-concept-plan-zoning-and-code-amendments-0. HECTOR CAMPBELL: 6:30 p.m. Monday, April 8, Milwaukie Public Safety Building, 3200 S.E. Harrison St. HISTORIC MILWAUKIE: 6:30 p.m. Monday, April 8, Libbie's Restaurant, 11056 S.E. Main St.
STAFFORD-TUALATIN VALLEY: 7 p.m. Tuesday, April 9, Stafford Primary School, 19875 S.W. Stafford Road, unincorporated West Linn. WRITING 101: This free writing class takes place from 1-2 p.m. Wednesdays through June 12 at the Pioneer Community Center, 615 Fifth St., Oregon City. Reserve a seat by calling 503-657-8287, ext. 0, or stop by the front desk. SPRING CRAFTS: All ages are invited to drop in for spring crafts from 2-4 p.m. at the Ledding Library's temporary space at 9600 S.E. Main St., Milwaukie. 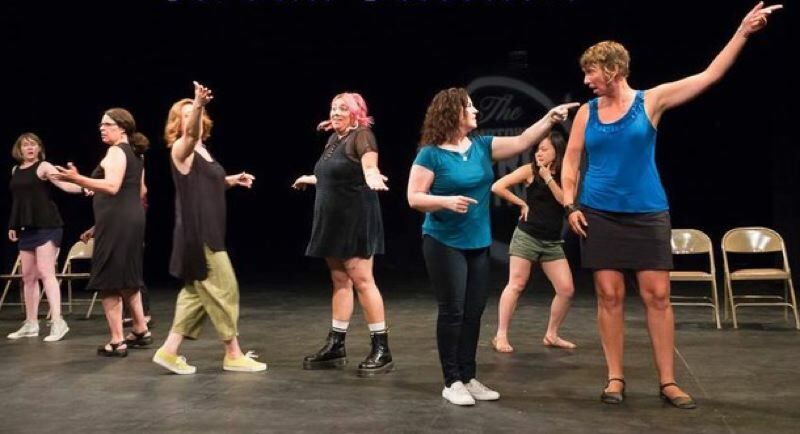 IMPROV: Bridge City Improv presents an evening of improv comedy with Moneypenny, Future Cool and Broad Selection from 7:30-9 p.m. at the Chapel Theatre, 4107 S.E. Harrison St., Milwaukie. Tickets are $10 in advance and $12 at the door. For more information, visit chapeltheatremilwaukie.com. MUSICAL PERFORMANCE: Kids and families are invited to celebrate Earth Day with musician and Eco-Edu-Trainer Magic Mama from 1:30-2:30 p.m. at the Oregon City Library, 606 John Adams St.
MAKE A ZINE: Learn how to make your own zine from published zinester Emilly Prado from 3-6 p.m. at the Oregon City Library. LOCAL PHOTOGRAPHY: "Exposing the Past Through Oregon City Photography," the newest exhibit at the Museum of the Oregon Territory, 211 Tumwater Drive, Oregon City, is open from 10:30 a.m.-4:30 p.m. Wednesday-Saturday. Admission is $8, $7 for seniors, $5 for ages 5-17, and free for children under 5. PINOCHLE AND BINGO: Bingo players get together 7 p.m. Tuesdays, and pinochle players are invited to play from 1-4 p.m. Mondays and Tuesdays at Concord Terrace Mobile Home Park, 3500 S.E. Concord Road, Oak Grove. Entry fee is $1 for pinochle; bingo is 25 cents per game. These games are open to the public. CHILDREN'S STORYTIMES: The Ledding Library offers the following weekly storytimes in its space at 9600 S.E. Main St., Milwaukie. Toddler Storytime at 10:30 a.m. Mondays and Tuesdays; Book Babies at 1 p.m. Mondays; Preschool Storytime at 10:30 a.m. Wednesdays and Thursdays; and Family Storytime at 6:30 p.m. Wednesdays. STORYTIMES: The Oak Lodge Library hosts three different storytimes at 16201 S.E. McLoughlin Blvd., Oak Grove. Babies and toddler storytime takes place at 11 a.m. Mondays; all ages storytimes take place at 11 a.m. Fridays and Saturdays.